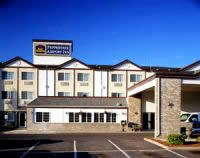 The Best Western Peppertree Airport Inn, welcomes you to relax and enjoy one of our all mini-suite guest rooms. Each suite has a separate sitting/work area complete with the latest technology as well as luxurious amenities and conveniences. Our hotel also offers an indoor pool, spa and fitness center that is open 24-hours for you to relax and unwind at your convenience. Also available is a 24-hour restaurant and lounge just a few steps from the hotel's front door. You can also start your day with our complimentary deluxe gourmet breakfast bar served daily. Our complimentary Airport shuttle operates daily from 5:00 am - 10:00 pm. Location: The Best Western Peppertree Airport Inn is located just five minutes from Spokane International Airport on Interstate 90, Exit 276. They are conveniently located fifteen minutes from Eastern Washington University, Northern Quest Casino, Fairchild Air Force Base and The Polo Fields.